This Cley Summerhouse installation in Aberdeenshire was a little out of the ordinary, in that its owners live in a pink castle, which they wished to colour match. The customer plans to use this Garden Building as a summer retreat, from which to read a book or host a dinner party. All our buildings include free delivery and installation as part of our exquisite service. 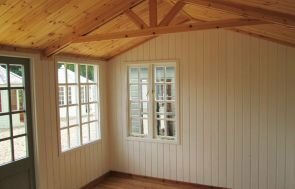 Each of our Summerhouses includes insulation and lining as standard. This particular model has been built using FSC® certified shiplap cladding and features painted matchboard lining, finished with a colour matched Farrow & Ball paint, in Porphyry Pink (No. 49). Farrow & Ball have created a highly durable product that is flexible and highly resistant to flaking, peeling, and colour fade, as well as being both fungal and water resistant. This ensures the longevity of the building. An electrical pack with heater has been included, paired with the standard insulation allowing the customer the use of this building all year round should they choose to. Our buildings are fully customisable to your exact requirements. 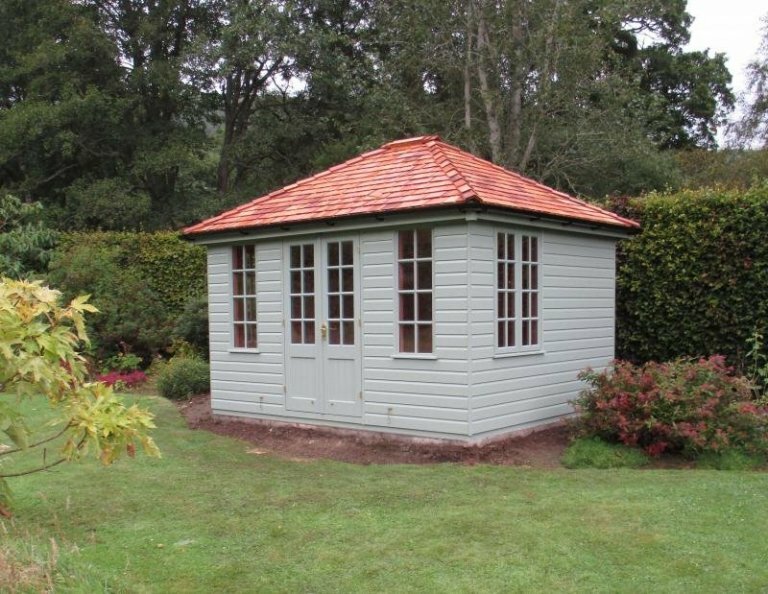 We display a selection of different Garden Buildings, including Summerhouses, in a variety of shapes and sizes at our seven UK show centres. We actively encourage first time buyers to visit a show centre so you can see the quality of our craftsmanship first hand. 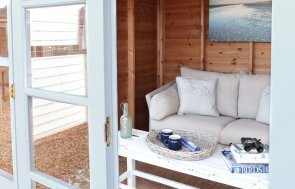 We have seven variants of Summerhouse, not just the Cley, here at Crane Garden Buildings. The others include: the Holkham, the Weybourne, the Blakeney, the Morston, the Wiveton and the National Trust collection - You can view these by following the link below.